Kanazawa is a relatively compact city and it can be explored on foot. However, bicycles, taxis and buses allow you to cover more ground quickly and easily. Here are all the details on getting around Kanazawa. Most of Kanazawa’s important sights are located within a 2km square so you can certainly do all your sightseeing on foot if you wish (I usually do). But, if the weather isn’t nice or you simply don’t feel like marching too far, buses and taxis are easy to use and convenient. The city also has a bicycle rental service. 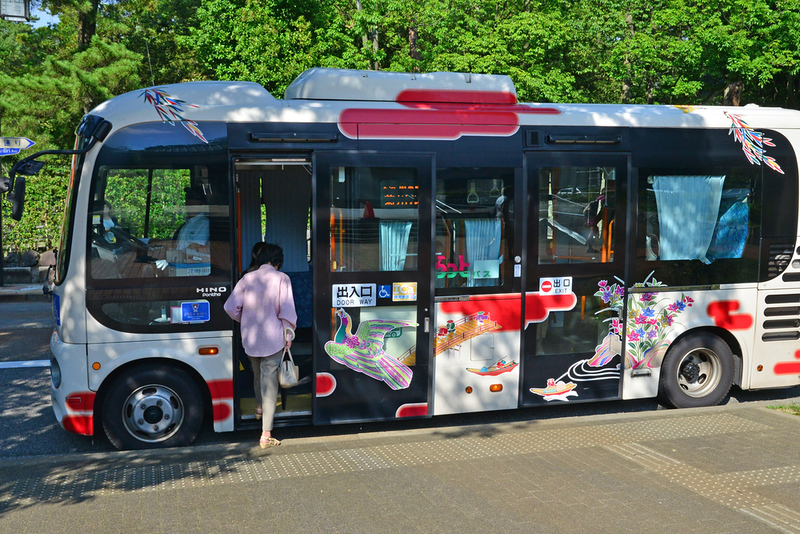 Kanazawa has two bus services designed specifically for tourists that make loops around the city, stopping at all the major spots. You can buy one-day pass for these so-called Excursion Buses for Y500/250 for adults/children. The normal city buses operated by Hokutetsu Bus are sometimes more convenient. For a bus map and additional information, ask at the Tourist Information Counter inside Kanazawa Station. Also, there’s a dedicated Transport Information Counter just outside the east (main) entrance of Kanazawa Station, near the bus boarding spots. Download a great English Bus Map of Kanazawa here. Taxis are surprisingly cheap and plentiful in Kanazawa and the drivers seem pretty used to dealing with foreigners. You can go most places in the city for around Y1,000, sometimes less. Since the standard bus fare is Y200, if you have three or four people, a taxi is only slightly cheaper than a bus ride. There are taxi ranks outside Kanazawa Station and at the major tourist spots. Or, you can simply flag a taxi off the street. Just wave your hand. You don’t have to open or close the door – the driver will do that for you. Here is a super-handy Kanazawa Taxi Fare and Destination Chart. (It’s in PDF format). Kanazawa has a rental bicycle system called “Machi Nori” that allows you to pick up and drop off bicycles all over the city. To be honest, it’s a little fiddly to register and use and the bicycles are not great (small wheels etc). I really wish there was a normal rental shop that rented large-size mountain bikes. But, if you really want to explore by bicycle, Machi Nori is the only game in town (as far as I could discover). Download a detailed Machi Nori English guide here.